New ERNO LASZLO Stars Club brings you a Hollywood Stars skincare experience, and special awards! Existing membership has been renewed on 1 Oct 2017, we wish you enjoy our latest privileges. 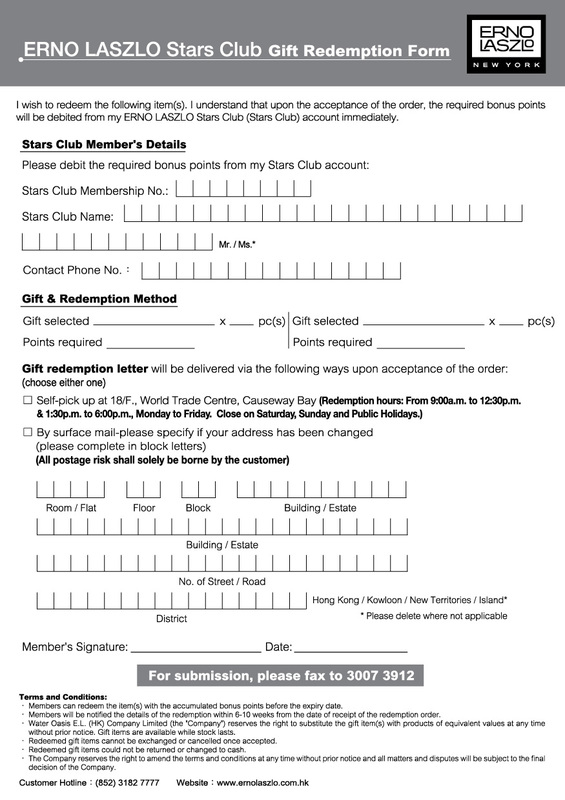 Enrolment in Bonus Point Rewards Programme with access to gifts. 1). Enjoy one-time 20% off on all Serum items. 2). Enjoy one-time 20% off on all Serum items. Enjoy any Beauty Face Treatment at the special price of HK$488. *Maximum purchasing totally 7 boxes on powder mask including Hydra-Therapy Vilality Treatment, Firmarine Lift Face Mask and White Marble Bright Face Mask. Terms and Conditions: Water Oasis E.L. (HK) Co. Ltd. reserved the final rights to amend offers, terms and conditions of this promotion without prior notice. All matters or disputes will be subject to the final decisions of Water Oasis E.L. (HK) Co. Ltd.